Color Me Green! - The color of the day is - of course - green! It doesn't matter what age you, players race to match these 'green things' from the clues given. 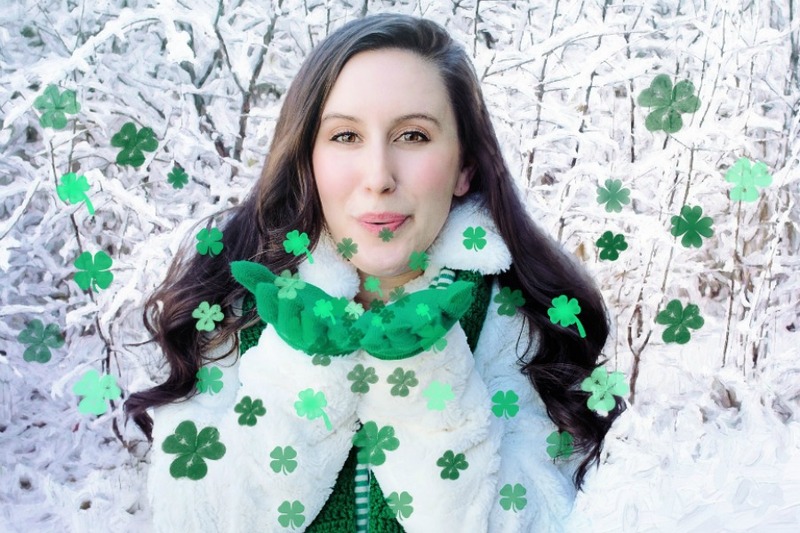 Luck of the Irish - Have ye the luck of the Irish? 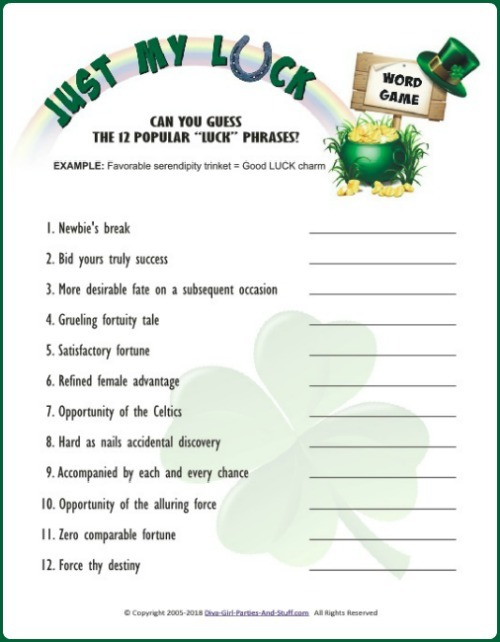 Find out which of your guests can be called lucky as they attempt to finish these phrases with the correct term. St. Patrick's Day Bingo - This is your classic Bingo game pre-filled with Saint Patrick's Day items. With our Game Card Generator, you get a different St. Patrick's Day Bingo Card for each player- even if you have 200 players! Call card included.Personalize It! 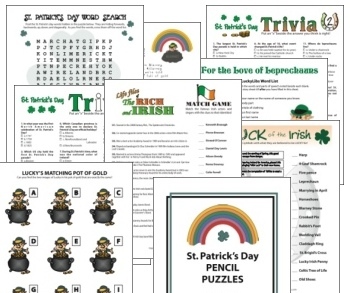 Now you can customize St. Patrick's Day Bingo with a title and your own choice of items! Generator will scramble items for unique cards. St. Patrick's Day Picture Bingo - Saint Patrick's Day Bingo made for the youngest players! All squares have pictures so even the little ones can play bingo. Call card with pictures included. 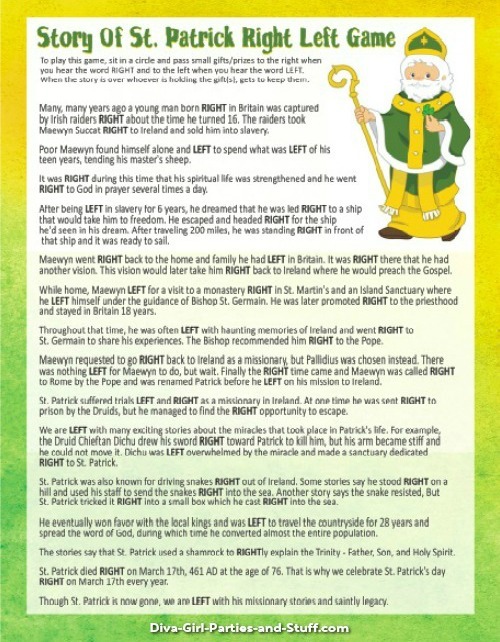 St. Patrick's Day Secret Message - Kids just love to decode secret messages! Have them cross out the letters and race to be the first to complete the hidden message. 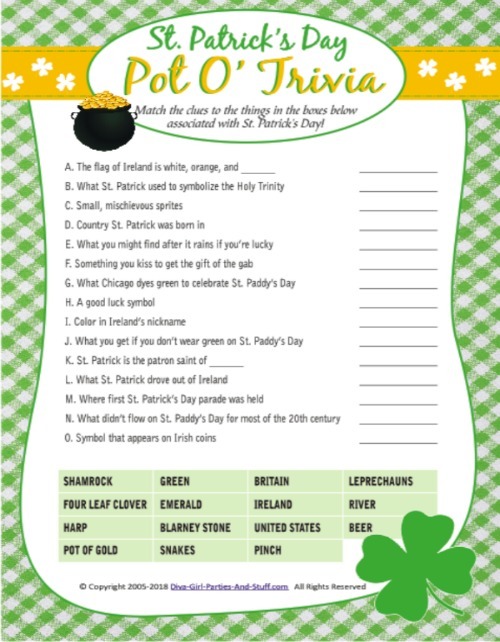 St. Patrick's Day This and That Trivia - Start thinking green because only the player who knows the most about this green holiday will be able to answer these little trivia facts about St. Patrick's Day and Ireland! St. Patrick's Day Tic-Tac-Toe - Fun, easy, and perfect for younger children! Let them pair up and play as many times as they want, or challenge them to a playoff where winners play winners until only one is left standing! With reusable chips, just clear the board when you're done…and this game could last all day! 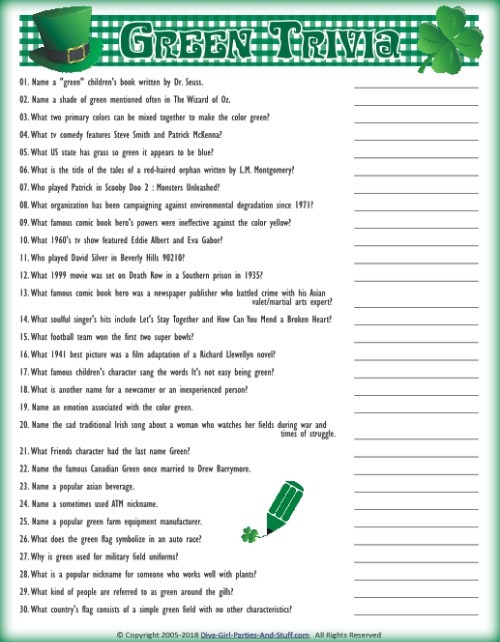 St. Patrick's Day Word Find - Test your guests' speed in this classic word search game. Guests compete to be the first to find the hidden St. Patrick's Day words. St. Patrick's Day Word Scramble - These St. Patrick's Day words are all mixed up and players race to unscramble them! Younger kids might take more time, but rush the adults to unscramble in 60 seconds and see what kind of laughter you can make. Sweet Sounds of Ireland - The sweet sounds of Ireland and the sweet sounds of victory are reserved only for the player who can complete these famous Irish song titles! Each song title is missing a key words and players must race to fill them in.